ELVIS "Bomber" Moyo has already started planning for life after boxing, and the plan is very simple. Help mould the next generation champion fighter and what better way to do this than one in his own image. The country got their first glimpse of this future champion last weekend as the Bomber knocked out Ukrainian heavyweight champion Maksym 'Iron Max" Pedyura. For the 34-year-old boxer, the win was the perfect opportunity to introduce his offspring to the world; one he hopes will conquer the boxing world. "When I won my fight last Friday, in my hands I had a future heavy weight boxing champion Elvis Junior whom I was yet to introduce to the world," said Moyo. "He is one-year-two months old and it was his first time to be by the ringside and I could not afford to lose in front of him. "I enjoyed every moment of it, and it is not the last time you either hear the name or see him," said Moyo Snr.For Bomber, the moment was all too perfect as he had his entire family with him as he once again wowed the crowd with his exceptional boxing skills. "I felt proud to fight in front of my whole family," said Bomber. "My eight-year-old daughter Oraine has watched almost 90 percent of my fights while my wife of ten years, Chiedza, has always been by my side. "Little Elvis was the missing piece to the puzzle and it felt good having everyone there with me," he said. However, before Little Elvis can start walking, let alone fight, his father still has a lot accomplish and that starts with Dereck Chisora. For once again, The Bomber reiterated his desire to get the UK based former Commonwealth champion in the ring and whack him around a couple of times. "I'm very serious, he is fighting in the UK because of the monies he has earned and the opportunities he has gotten there. "Until I smash him around, only then will Zimbabwe heavy weight boxing be mentioned in the same breathe with other fighters in the world," said the 34-year-old boxer. Apparently, Moyo has no beef with the aforementioned fighter, but views him as a stepping stone to the big time rather than anything else. "There is no beef, just business," he said. "Whenever heavyweight boxing or Zimbabwe boxing is mentioned, Derrick's name comes up. 'I believe he is in my way and I am constantly in his shadow. "My journey into Europe is guarded by opportunities, and those that have come my way also seem to crumble. "First I was supposed to fight Adam Machaj in England and for some reasons he pulled out of the fight three weeks before the fight. "After then it became difficult for me to get any invitation. "In March we had managed to secure another fight and everything was in place but again the fight was called off after they pulled out, "he said. "If you have a Zimbabwean passport, and a Zimbabwean bank account, things get a little bit harder because for some reasons we do not have the credibility," he continued. "It is a bit hard but at the moment I am meeting people so that I can get connections and I remain hopeful that things will work-out. "In the meantime, I believe he is the closest target I have to a big fight, if persuaded nicely and ends up facing his fears and accepting my challenge,"said Moyo. Moyo was introduced to fighting at the tender age of 14 when self-defence was the only option in Nkulumane, a high density suburb in Bulawayo. "I started doing self-defense classes in martial arts because in Nkulumane were I grew up it was a rough suburb. "I then moved on to amateur boxing around 2002, as it was a good way to stay fit and have fun at the same time," he said. Bomber's defining moment then came in 2008 when he decided to move to South Africa. There he took part in a couple of fights, three to be exact, but lost all. 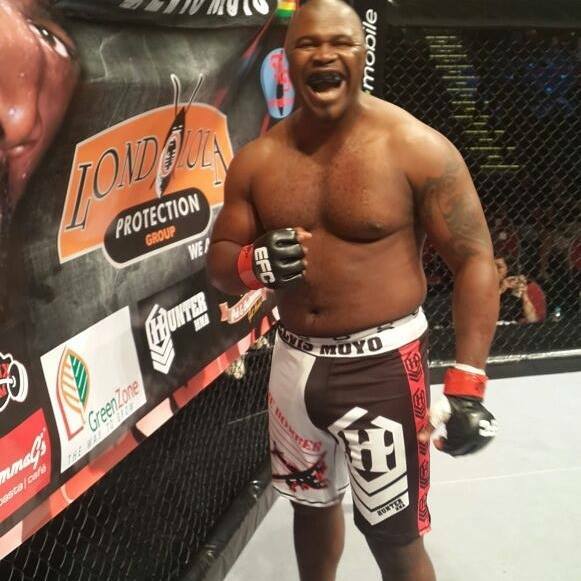 Three years down the line, Moyo was then crowned World Boxing Federation All-Africa heavyweight champion, but due to limited resources, the Bomber had to venture into Mixed Martial Arts (MMA), where opportunities to fight were plenty. "When I was crowned a champion in 2013, I could not get opponents and I did not have a promoter because boxing was dead in Zimbabwe. "I ventured into mixed martial arts because opportunities were plenty there. The opportunity of switching back to boxing came in 2016 on his way back to South Africa after an MMA fight in Japan, when his promoter managed to convince Econet, through its Kwese brand, to promote boxing in Zimbabwe. Moyo grabbed the opportunity with both hands and the rest is history.